A University of Utah team have a working prototype of a new twist on fluid-filled lenses for correction of vision problems: automatic adjustment and refocus depending on what you’re looking at. Technically, the glasses have a distance sensor embedded into the front of the frame and continually adjust the focus of the lenses. An 8 gram, 110 mAh battery powers the prototype for roughly 6 hours. Eyeglasses that can adapt on the fly to different focal needs is important because many people with degraded vision suffer from more than one condition at the same time, which makes addressing their vision problems more complex than a single corrective lens. For example, many people who are nearsighted or farsighted (where near objects and far objects far objects and near objects are seen out of focus, respectively) also suffer from a general loss of the eye’s ability to change focus, a condition that is age-related. As a result, people require multiple sets of eyeglasses for different conditions. Bifocal or trifocal or progressive lenses are really just multiple sets of lenses squashed into a smaller form factor, and greatly reduce the wearer’s field of view which is itself a significant vision impairment. A full field of view could be restored if eyeglass lenses were able to adapt to different needs based on object distance, and that is what this project achieves. 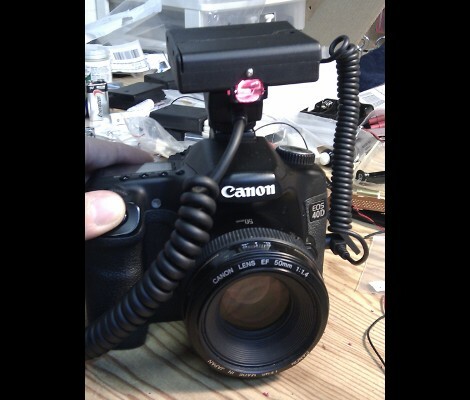 [Adrian Onsen] keeps making improvements on his auto-focus assist hack for DSLR cameras. The module seen above is version 3.0, which makes a few changes to the previous hardware and also presents a much more finished look. With version 2 [Adrian] was using a defocused laser to illuminate dark subjects so the DSLR auto-focus could be used. It worked, but wasn’t really ideal. This time around he’s swapped out the laser diode for an autofocus assist lamp salvaged from a Canon 550EX he picked up ‘as is’ on eBay. It is mounted on the front of his project enclosure, using two alkaline batteries for power. It sounds like [Adrian] is struggling a bit with his circuit design. 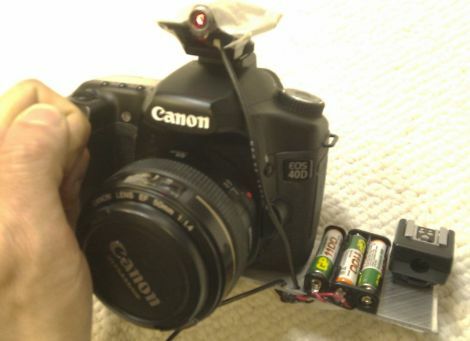 He want’s to make it work with either alkaline or rechargeable AA batteries (just two, down the from four AAAs used in version 2) but so far the rechargeable are a no-go. They power the circuit, but must not put out enough light for the sensor to work. Future plans include getting rid of the external cords by adding a hot shoe connector. We don’t know if our feature from a couple of days gave [Adrian] a kick in the pants, or if he was just on target to finish is writeup this week, but he’s posted about version 2 of his laser auto focus assist project. The original idea was to use an unfocused laser pointer dot to give his DSLR auto focus feature a kick in the pants since the built-in light doesn’t come back on when photographing moving subjects. The original version worked, but he had to operate the laser manually and the hardware was kind of spread out all over the camera. The latest version (2.0) can be seen above, housed in a project box that mounts to the hot shoe and keeps everything together in one package. The laser operation is now automatic, coming on when the shutter trigger is depressed half way, or when the auto focus enable button is depressed. The controls on the project box include an on/off switch as well as a potentiometer which varies the intensity of the laser. It looks like this won’t be the last version of the hardware that we see. [Adrian] covers a few outstanding problems in his post. Most notably, the laser light is still a bit too strong. At a recent live event, another photographer took issue with the fact that his images included the red splotch from [Adrian’s] diy hardware. [Adrian] uses his Canon 40D quite often in dark or low-light situations, and found the onboard auto focus assist functionality to be a bit frustrating. In certain focus modes, the auto focus assist light is programmed to turn off once focus has been achieved. He noticed that if his subject moves or the focus point changes before he snaps the picture, the AF light does not come back on to assist in refocusing the image. To work around this problem, he decided to build a supplemental auto focus assist light that could be triggered at will. He purchased a cheap laser pointer with an adjustable lens, then cut it open to get at the good parts. He mounted it on top of his camera and tweaked the lens to produce an unfocused beam of light that measures about 6” x 12” at five feet. The laser pointer did the trick – his images are coming out much nicer now that he can easily recompose his shots in low light. While it works great, he’s not completely satisfied with the build, especially with the fact that he has to manually trigger the laser pointer. 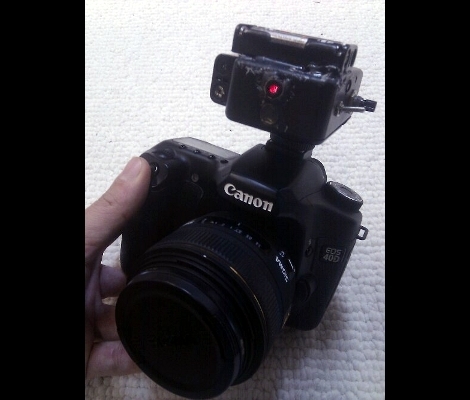 Version 2 is in the works however, which employs an old hot shoe to trigger the laser whenever he pushes the shutter release halfway down. According to his blog he is having some timing issues, causing him to capture the laser in most of the pictures he takes. [Adrian] is working hard to correct the problem, and we’re sure he’d appreciate any tips you might have.